The Chargers want to use WR Travis Benjamin more as a punt returner in the upcoming season. Benjamin returned nine punts last season, compared to 15 and eight for teammates Isaiah Burse and Dexter McCluster, respectively. 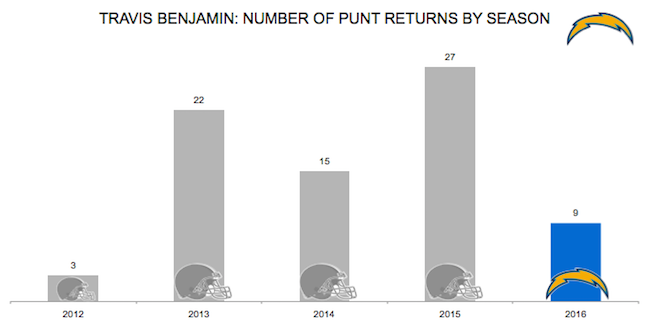 The last time Benjamin was extensively used as a punt returner was with Cleveland in 2015. That season, he returned 27 punts and graded as the fifth-best punt returner in the league. In 2015, among players with at least 20 punt returns, no one recorded more average yards per return than Benjamin (12.0). Benjamin has three career punt-return touchdowns in his five years in the league. The Chargers last recorded a punt return touchdown in 2012.